Any person living or owning property in Beaver County may register for a free library card. Your library card is valid at all libraries. Library cards are renewed every 3 years. A driver's license or other form of photo identification is necessary. A verifiable written form of identification, including current address, is needed to apply for a library card. Children under 12 are eligible for a library card with parental signature and identification. Resident students attending a Beaver County college may register for a 1 year library card with proper student identification. Register by paying an annual fee. The Library is open to the public for reading, studying, examining and selecting library materials, and participating in related library programs and activities. Library users are expected to respect the rights and privacy of other users, library staff, and volunteers and not disturb others through noisy or offensive activities, cell phone use, monopolizing resources, or other behaviors that may reasonably result in the disturbance of others. Damage, destruction, or theft of library property is prohibited. Physical, sexual, or verbal harassment of library users, library staff, and volunteers will not be tolerated. Young children must be accompanied and supervised by an adult at all times. Library staff is not responsible for the care, safety, and supervision of children. Library staff reserves the right to limit or prohibit the consumption of food and beverages within the library building. Pets or animals, other than service animals, may not be brought into the library without prior permission of library staff. Library users are expected to wear appropriate clothing while in the library, including shirts and shoes. Good personal hygiene is expected so that body odor or excessive use of scented products is not offensive to others. The use of bicycles, skateboards, scooters, rollerblades, etc. is not permitted in the library. Renewals are not permitted on these items, and $1.00 per day will be charged for each overdue item. Current materials and historical, genealogical or reference materials are usually not available from other libraries. 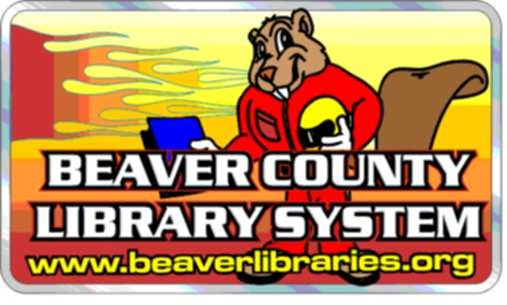 The Beaver County Library System provides public access to information of all types in a wide range of formats to fulfill its mission of meeting "the informational, cultural, educational and recreational library needs of the residents of Beaver County." We are pleased to provide internet access as one tool used in the fulfillment of this mission. To ensure that your internet experience in our libraries is both pleasant and informative, the following policies have been adopted and are used by all public libraries in Beaver County. If you need further assistance or have questions, please see your library staff. Internet access is available to patrons in good standing (no fines or charges over $5) who have a current Beaver County Library System card, or an Access PA sticker on their home library card. Before you can use the internet, you must sign the Internet Usage Agreement located on the back of the library card registration form. Patrons under the age of 18 must have the Agreement signed in person by a parent. Patrons under 12 must have an adult sitting with them at the computer at all times. You should be familiar with Windows and a Web browser before you use the equipment. Internet computer use is free. However, there is a per-page printing charge to offset the cost of ink and paper. Problems with a computer or printer should be reported to a staff member immediately. Misuse of the equipment is prohibited and downloading and outside discs or drives are not permitted on the computers. The computers may not be used for unauthorized or illegal purposes. Viewing "obscene and other sexual materials and performances," as defined by 18 Pa.C.S.A. 5903, is not allowed. It is the patrons' responsibility to use discretion in viewing internet sites and web pages. The Children's Internet Protection Act (CIPA) was enacted by Congress in 2000 to help protect all computer users from explicit, objectionable content. In compliance with CIPA, member libraries use filtering systems that ensure the internet is used responsibly and that restrict access to sites that are explicit or objectionable. Library staff reserve the right to ask a patron to discontinue use of a site. Disclosing personal information on the internet is strongly discouraged. The library will not take responsibility for any damages that may occur from doing so.